Every growing season can bring a wide range of ups and downs, so it’s important to have an agronomic partner you can trust to help you make the right decisions for your fields. We have nine agronomy centers located throughout northwestern Minnesota – four of which have large fertilizer plants to meet the needs of our customers. We also provide the services that apply to all the products we carry, from custom application and site-specific variable rate treatments, to crop scouting, soil sampling, delivery, seed treatments and inoculating. West Central Ag sells and supports some of the best crop seed on the market. Whether you’re looking to plant corn, soybeans, wheat or sugarbeets, we can help you select the best hybrids or varieties for your acres. We also sell custom and branded seed treatments. 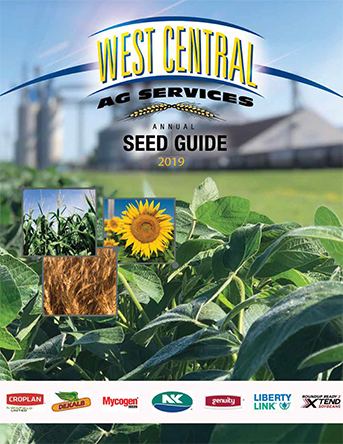 If you’d like to learn more about specific hybrids and seed varieties that are popular with farmers in our area, click on the adjacent image to download our annual West Central Ag Seed Guide. We are proud to offer the following seed brand portfolios listed below. At West Central Ag, our agronomy team uses leading-edge technology and comprehensive precision farming solutions to provide accurate, cost-effective field prescriptions. In fact, creating variable rate fertility scripts for different areas of your fields is one of our biggest strengths. We use SMS™ Software and GK Technology ADMS to assign the right fertility and liming rates for different plots of land within a single field, which helps increase input efficiency and improve overall field performance. In addition to improving profit potential, variable rate fertility treatments can help improve environmental sustainability by reducing waste. We can also use these programs to create variable seeding prescriptions to match the best hybrids and varieties for each area of your fields. Our expert agronomists also leverage the platforms listed below to store data and help you identify and better manage the acres that provide the best opportunity for increased profit potential. If you’re ready to start using precision ag strategies on your acres, contact Casey Krieger at 218-401-1064 or casey.krieger@westcentralag.com. In-season satellite imagery analyzes field biomass on a daily basis to identify whether crop development is above average, average or below average compared to other area fields. Seven- to 10-day crop development comparisons help identify overall trends across your geography. Predictively determines optimal timing and rates for nutrient and water applications during the season by using field-specific information, Answer Plot® data and NutriSolutions 360® analysis to simulate daily crop growth and development. Runs different scenarios during the course of the growing season to gauge ROI potential. Keeps all your data in one place with connectivity across many equipment types, makes, models and systems. This enables easy collection, storage and viewing of field data for more of the inputs you manage during the season. Uncovers valuable insights for next season with tools that help you analyze crop performance at the field level or by field zone. Using in-season imagery to identify issues early helps you take action to protect yield. Helps you optimize inputs to maximize yield and profitability on every acre with variable rate seeding prescription tools, nitrogen management tools and fertility scripting tools. West Central agronomists can visit your farm at different points during the growing season to take plant tissue samples. NutriSolutions® tissue testing and analysis pinpoints nutrient deficiencies at critical growth stages so we can help farmers make adjustments before yield potential is compromised. We can also import tissue data results into the R7® Tool for a complete review of previous seasons to help you plan for next season. 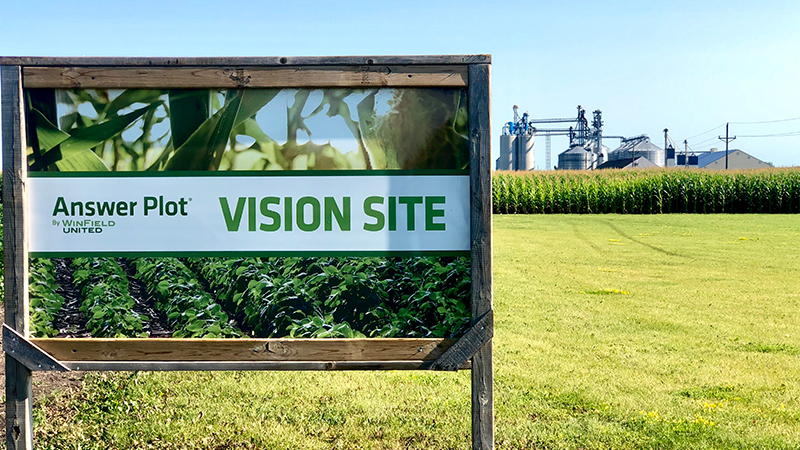 The Answer Plot® Program by WinField® United is your year-round resource for local agronomic, seed and crop protection expertise, strategies, and the latest information and data. When attending local Answer Plot® Knowledge Events, you’ll find customized answers that can apply to the challenges you experience in your own fields. Our local Answer Plot® site is stationed in Ulen, MN. Check back periodically to see when the next Ulen Answer Plot® VIP Week will take place. To see data from the National Answer Plot® site, click on the Learn More button below. We also plant a number of our own Performance Plot field trials across the West Central Ag service area every year. These showcase popular corn hybrids and soybean varieties in our area and demonstrate how they perform with and without different crop protection treatments. Check back for yield data reports and other information. West Central Ag Services has an experienced team of professionals to partner with you. We operate nine retail locations and four large fertilizer plants* to best serve our customers. Click on the respective link below for location and contact information.